Starring: Andy Samberg, Jorma Taccone, Akiva Schaffer, and more. Requested Review from JUSTIN BIEBER….I mean… Abby McNatt and Erica McNatt! Wow, I had high hopes for my review blog to kick off but I NEVER THOUGHT that Justin Bieber himself would request a movie for me to review. Well, an email came through to me saying it was Justin Bieber. Ok, it was not Justin Bieber, you all caught me… It was my dear girlfriend that emailed me saying to review ‘Popstar: Never Stop Never Stopping’ which was penned as “Justin Bieber”, but ALSO, my dearest friend Erica also wanted me to review this because I had a burning desire to not see this movie so, here we are. My review of ‘Popstar: Never Stop Never Stopping’ coming at you, requested by Abby and Erica McNatt! When a former boy band artist goes solo due to his rising popularity compared to his fellow band mates, Conner “Conner4Real” (Andy Samberg) skyrockets to super-stardom in his solo career but finds out that what goes up, must go down. Conner then does all he can to keep his popularity at an all time high, no matter what it takes. So, again, I had zero expectations to enjoy this movie. I expected 87 minutes of dragging, over-the-top stupid humor, and ultimately a burning desire to see credits rolling, but to my pleasant surprise, I actually did not hate this movie. Now pump the brakes… I did not love it. It is not my underrated comedy of the year, it simply was better than I expected. When you see Andy Samberg, Akiva Schaffer, and Jorma Taccone tagged to a film, you should already expect ‘Saturday Night Live’ satire and humor. 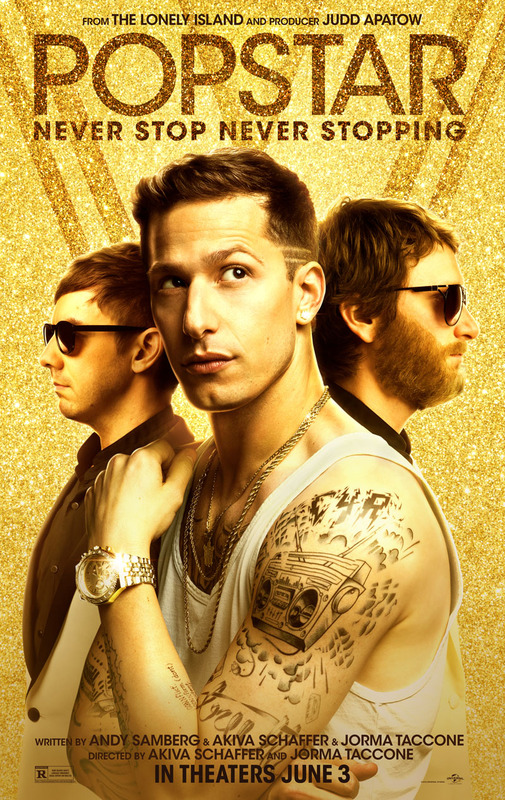 ‘Popstar: NSNS’ simply was an SNL skit expanded to a feature film length, much like its previous successors when popular SNL skits were turned into films. The satire of the pop music world was clever and hilarious at moments and it definitely had those moments that made me laugh at how much the film tore apart notable pop stars in the music world. Now that is the extent of the positives for this flick. Once the film reaches its climax, it loses its steam and quickly becomes a snooze-fest. The comedy quickly reaches too far to pull laughter from its audiences, meanwhile I was already out the door. Again, not a total failure as I was anticipating it to be. It had its fair share of moments where it vultured a laugh or two out of me and the ever susceptible topic of pop culture and its superstars were ripe for the picking to create clever and relentless jokes of which I enjoyed. But nonetheless, it was a 50/50 movie with a teetering edge in the positive direction due to the satire comedy.